The Rare Book Room was given to the library by the Department of Surgery and is dedicated to Dr. Donald Silver, an Emeritus professor of the University of Missouri-Columbia, Department of Surgery. The Rare Book Room is located on the third floor of the library. Viewing hours are by appointment only and can be made through the Administrative Office (573)882-7033. Items circulate and can be copied by special permission of Deborah Ward, Director of the Library, or Rich Rexroat, Head, Technical Services. Rare is not rare because of the dollar price of the item. Rare is rare because of "rarity", i.e. there are few items in existence; because they are primary resource materials, because the intellectual content of these items is significant: and they are old and fragile. One or more of the above criteria establishes an item as rare. 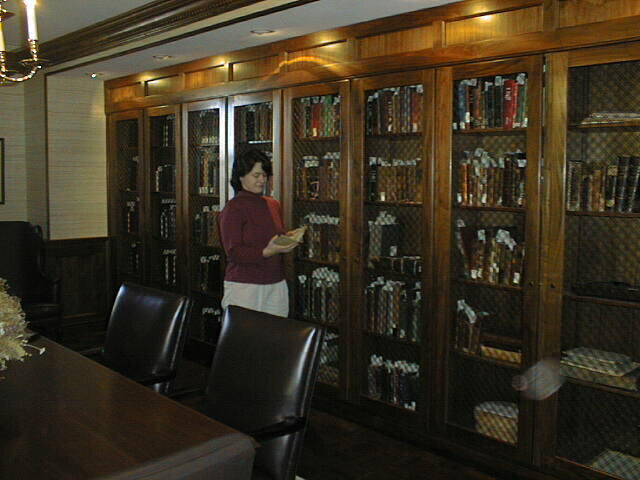 Items are placed in the Rare Book Room if selected by the Director of the Library or printed or published before 1900. Other criteria for selection are the book is an example of fine paper, binding, printing and contains significant illustrations. Also some titles are placed in the Rare Book Room which the library cannot replace without great cost, or are expertly produced facsimiles of manuscripts and early printed books. An item is given rare book status and retained in our library if the item affords a needed perspective on contemporary studies, or provides the opportunity to learn about early developments in the field of medicine. Other criteria include providing a historical focus on the patient, the medical environment, or medical institutions. Items, which identify a historical person or trends in medicine, or have a historical background to technological breakthroughs, are also given rare book status. The complete policy statement for the Rare Book Room is stored in the cataloger's office in Technical Services. © 2019 Curators of the University of Missouri. All rights reserved. An equal opportunity/access/affirmative action/pro-disabled and veteran employer. DMCA and other copyright information.